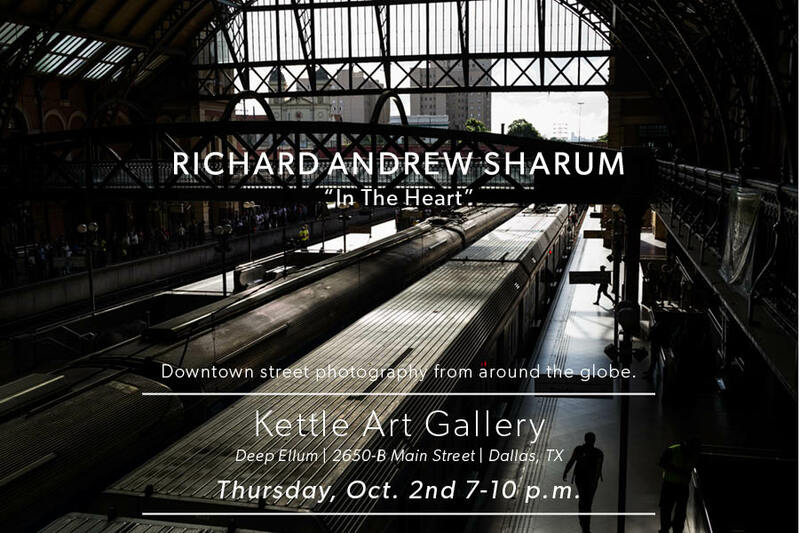 Kettle Art Gallery presents “In the Heart: Downtown Photography from around the Globe” by Richard Andrew Sharum. Please join us for the opening reception on Thursday, October 2, 7-10pm. The exhibit runs through Saturday, November 1. Richard Andrew Sharum debuts his compelling series documenting the often obscure landscape of urban spaces around the world and the inhabitants of these areas. Sharum’s images depict the contrast between flesh and architecture, the fragility of life juxtaposed with formidable concrete structures, and the light that both illuminates and deepens the shadows between them. In recognition of Sharum’s work on the series abroad, he was selected among international applicants for the Magnum Photos (Paris) Masterclass with Jonas Bendiksen during HOST at FOTOGRAFIA EUROPEA 2014 in Reggio Emilia, Italy, and for the Magnum Photos (New York) Masterclass with Moises Saman and Abbas in Sao Paulo, Brazil. Both resulted in public exhibitions of his work in each respective city. In Summer of 2014, Sharum launched “Observe Dallas”, a public installation project aimed at encouraging observers of anonymously placed photographs within the Downtown area to interact with their surroundings in unique ways. Richard Andrew Sharum is a Dallas-based photographer whose range varies from documentary photojournalism to abstract minimalism. Sharum’s work is included in several private and public collections across the country. Commissions include those by The Meadows Foundation, Harvard Law School, Children’s Medical Center (Oncology), Children’s Cancer Fund, Angelflight, Notre Dame School for the Mentally Ill, and Austin Street Homeless Shelter, among others. Publications include D Magazine, International Business Times Weekly (New York), The Wall Street Journal, The Dallas Observer, and The News-Register.